Park Tool’s DS-1 Digital Scale is a versatile digital scale with an easy to read display, built to accurately weigh bikes, frames, and components. The unique design allows the DS-1 to be clamped securely to a repair stand or hung from a hook or branch. The hook has a silicone coating to prevent scratching. The DS-1 is ideal for professional bike shops and home workshops. 25 Kg (55 lb) weight limit. 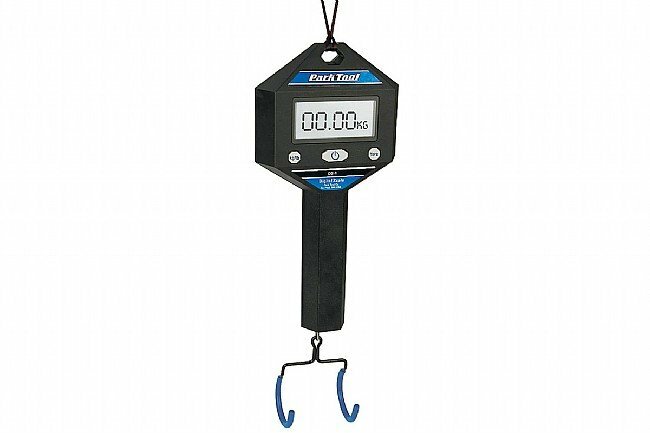 The Park Tool DS-1 Scale is convenient to use and appears to provide accurate weight measurements. I like that the design accommodates using it in the Park Tool PCS-10 work stand, which is how I mount it for use in my apartment. The 2 prong hook allows for easy balancing of a bikeframe to provide good results. While there may be some slightly less expensive scale options out there, I'm glad I chose the DS-1. Great scale - easy to use and especially easy to read. Great and accurate scale - easy to read and change units on - and simple to hold in Park bike repair stand. Prior scale had problems killing batteries left in them (luggage scale) - this one doens't have this problem. Double hook controls bike hanging. VERY ACCURATE AND PRACTICAL .AT A GREAT PRICE.